In the parable, Jesus said, “A man had two sons.” Both of these sons were given direction to work in their father’s vineyard. One said no, but later went. The other said yes, but did not go. Which of the two did the will of his father? 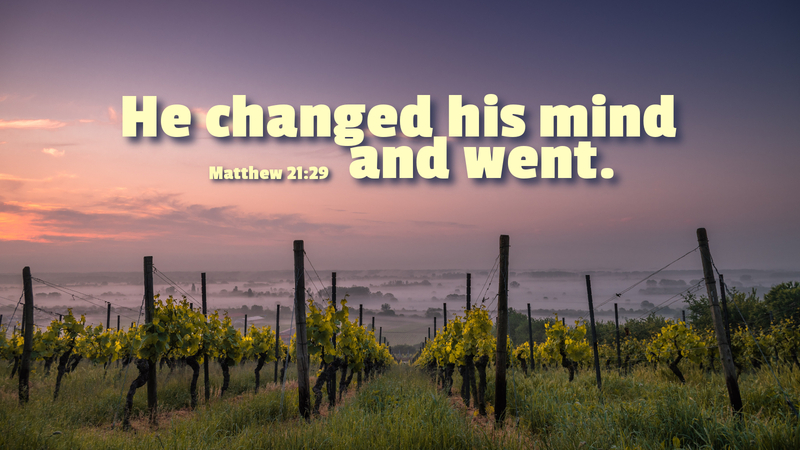 According to the Pharisees, it was the son who said no, but changed his mind. How often have you heard God’s Word and said, “No, I will not go,” but later went? How many other times have you said, “Yes, I will go,” but failed to do so? In each case we fall short of God’s glory and need a change of heart. Thankfully, through Christ we are afforded God’s mercy and grace. All we need to do is ask, and God will provide the will and means necessary to do that which he calls us to do. For the will of the Father is that we believe in his Son.